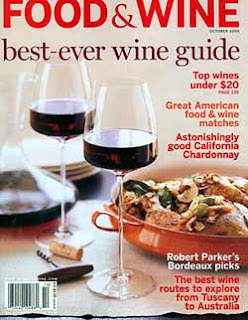 If you didn’t know, my favorite magazine of all time is Food & Wine (F&W). So if any of you living in the states right now want to be generous, you are welcome to mail me this magazine here in France. (They unfortunately do not deliver here) Until you do, I will have to do with the shortened version online. But that is still alright with me. They offer amazing articles on wine and their recipes and articles on food are mouth-watering to say the least. In my browsing of F&W I came across an article that is just plain fantastic. It is called “30 Years of Wine Trends: A concise history from the world’s most famous wine critic” written by the ever-famous, ever-criticized Robert M. Parker, Jr. Now I know many people blame his 100 point system for many reasons, but we can all agree that he knows his wine facts and can legitly summarize the last 30 years of wine trends. This article is great for any of you who are still novices at wine and even more useful for those of you who think you know a thing or two. This is a great jumping off point to do more reading or researching on the trend(s) you find most appealing. It gives you some great wine names to know, some great conversations starters and at the very least you will have some great topics to bring up next time you are find yourself in a conversation about wine! You will look like the total wineaux! Look forward to hearing your feedback! In case you didn’t know, you are more than welcome to follow my blog. Look for the button on the right hand side of this page! I would love to know who is reading blog! And feel free to leave any sort of comments even if you don’t like my post/the article, let me know! Or perhaps you didn’t understand something and you want some more details or want me to write a separate entry on something! I would love that! Hope to hear your feedback! Until the next post!